I’ve been studying public relations 44 years now. Never have I witnessed anything like last week’s election. My candidate lost, but that’s happened before and likely will again. Each time the republic has survived, even though each time I worried it would not. I’ve accepted the election outcome but remain troubled by the role communication strategists played. Truth was sacrificed in this election, and while that’s hardly news in American politics, we can’t accept lying as standard operating procedure. It’s wrong. But what bothers me far more than the lies is that human respect and decency were also cast aside. That’s worse than wrong. It’s tragic. And we can’t forget that professional communicators created many of those messages and strategies that agitated and divided us. Messages from the Trump campaign were particularly disturbing, often featuring racist, homophobic, xenophobic, and sexist themes. Voters saw the evidence each day in the news, but mostly we shook our heads at what a circus the campaign had become. 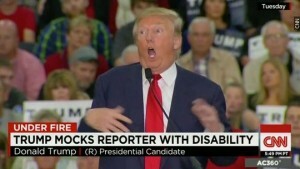 No moment was more insulting than the one depicted here, but we probably can’t blame a PR person for the mocking of a disabled person. It was just Trump being Trump. I worry a great deal about the loss of civility in our culture and our campaigns, but I also worry for the future of the public relations profession. How many PR types working these campaigns took the same academic courses as my students? Did they ever set foot in an Ethics class or stop to consider the morality of their actions? Do they place no value on human decency and regard for others? I’m not writing from a partisan perspective today. It’s a little late for that. I’m writing as an educator who believes the primary job of ethical communicators is to foster dialog and create understanding. We won’t accomplish this by fueling hatred and intolerance. A friend reminded me yesterday that we live in a postmodern world where objective realities and objective truths no longer exist – or so the theory goes. And that certainly makes our job as communicators tougher than ever. We can do one thing: The next time someone proposes an unethical strategy and you’re in the room, show a little courage. Tell them it’s a line you just won’t cross. To my students: If you want to chat about these issues one-on-one, drop me an email or reach out to your favorite faculty members. We’re all wrestling with the same concerns. Because we all believe in the ethical foundations of our profession. You also can post at the MA-JMC Facebook page. We won’t change the world, but we can start a conversation. As (probably) one of your youngest grad students, this was the first election that I was able to vote in (I could have voted for the last election but was unexpectedly in the ER all day, and I’m ashamed to say I wasn’t concerned with politics at the time). I often found myself simultaneously thinking *WHAT IN THE WORLD? * and *His PR team is masterful* – and not in an ethical way. I honestly have a hard time believing that one person can say and do as many things as he did on his own. I can’t imagine that he would naturally have so little regard for others. I can only assume that these behaviors were simply undercurrents amplified by whispers in his ears turning them into tidal waves of social destruction. I know he was always a sketchy guy. But I still think his PR team recognized the fear and hatred that his offhand remarks inspired. Ever the showmen, the ring masters made the lion roar. Showmen and ringmasters. This isn’t the first time I’ve seen Trump compared to P. T. Barnum. He knew what the masses wanted and he delivered. But if you know your history of Barnum, you know that he was never concerned with truth or authenticity. His only goal was to move bodies through the turnstiles. He didn’t give a lot of thought to understanding or relationships, trust me. It’s quite a parallel, and historians will use the Barnum comparison over and over. I think you give Trump’s PR team (if there was one) way too much credit. All indications are that this is a one-man show and that Trump routinely ignores advice that goes against his gut. The person who survived longest seems to be the person who was able to sublimate everything into mitigating Trump rather than call him out on his message or craft a coherent story. Wait. I take that back. Trump had a coherent story all along. Early on he said that he could shoot someone on Fifth Avenue and his followers wouldn’t care. Everything that followed proved that to be true. You’re probably right, Melanie. But as you point out, the strategy was consist, so it was part of the master plan. For any ethical PR professional. Trump is an entertainer, and he puts on a show that people can’t seem to ignore. No ethical PR professional would concoct such a strategy, but a lot of them will let this sort of content slide through in order to keep the paychecks coming. This campaign will be a sidebar in the ethics chapters of the PR textbooks. Throughout this campaign, I kept thinking to myself, “His PR crew are doing everything we’ve been taught not to do.” It really puts our work to shame and does not lead by example. But fear not, I can guarantee a great number of your former students will have the courage to stand up for this profession and stay on the ethical side of the line. Thanks, Kathryn. I’ve already heard from one former student who did stand up for ethics and paid a hefty price for doing so. What a shame that good practitioners find themselves unemployed for doing what is good and what is right. Some perspective on this comes from watching “The War Room,” about the 1992 Clinton campaign. How do I know? I watched it last night. To sum up my thoughts: As an American citizen and a father, I hate the way the rules of public discourse are changing. As a feller who makes his living helping speechwriters and other communicators understand the rules of public discourse, I mind that the rules seem to be going away entirely. It’s hurts me to call manipulators like Steve Bannon (Trumps campaign lead, now strategic advisor) a “PR” practitioner, but the truth is the skillsets of this profession can be used for both good and bad. PRKent nor PRSA have a grasp on the perception of PR, and this political campaigns has only thrust more doubt onto the ethical (and innocent) practitioners who still identify with the public relations label. Match this strategy with a campaign manager who can publish dozens of stories and hundreds of headlines a day to gauge which rhetoric has the most social influence and you get a puppet willing to say anything it takes. And that phrase? “Anything it takes”? That should be a warning sign for more than just PR people. Ethical behavior is everyone’s job; let’s just hope those of us in the room steering the convo are willing to stand up for the right thing and are able to do it with civility and impact. Chris: The Trump rhetoric taints our profession, even though we’d like to think that no TRUE PR professional would engage in such tactics. As I look for a bright side to the election, I’m trying to see it as triggering event — you know, a WTF? moment that redirects people to more enlightened ideas and rhetoric. And gets them to act on it. Check out the link I posted in the next comment. Would love to see another RFK emerge to lead a progressive movement.